Do you suffer from body aches and pain? Do you feel fatigued or have low energy? As I got older, I started noticing that my energy levels were not the same as they used to be. I found that if I wasn’t getting an adequate, restful sleep or dealing effectively with stress, I often felt exhausted. Using PEMF therapy, I have noticed a huge difference in my energy level and cognitive function. Never take your energy for granted! As we get older, energy becomes a valuable commodity and our cells can face an energy crisis. We have all experienced low energy and fatigue. This happens when there is a disruption of energy production in our mitochondria (the powerhouse of our cells) leading to reduced cellular energy, affecting the cell’s ability to function properly, heal and regenerate. Our PEMF technology recharges your batteries by increasing the ATP production in the mitochondria of your cells. ATP is the energy currency that drives all of our biological processes; from immunity, respiration, circulation, and organ function to movement. PEMF therapy opens all the channels and pathways for the essential elements needed to create energy in our mitochondria. 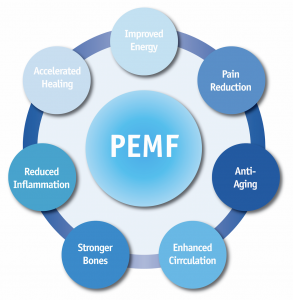 PEMF helps with inflammation and edema (swelling) by restoring the sodium and potassium exchange within our cells. This leads to pain reduction and increased wound and bone healing. The body knows how to heal itself, it just needs the essential building blocks, including pure filtered water, organic fruits, sprouts and green leafy and colorful vegetables, sunlight, oxygen, and the earth’s PEMFs. Our PEMF technology supplies the energy needed and opens the channels that transport all of these essential elements of life into your cells. What will I notice after a session? You will first begin to notice subtle changes to your personal quantum field, such as increased energy, clarity of thought, reduced muscle tension, a general feeling of wellbeing and better sleep. Gradually, after several sessions, the body begins to detox and eliminate harmful waste materials through urine and bowel movements. Once the body burdens are removed, the cells can then be nourished with oxygen, minerals, and vitamins. Stem cells begin to regenerate and repair damaged organs.